Typically used to remove particulate from a gas stream, the gas enters tangentially at the top of a cylinder and is forced downward into a spiral motion. The particles exit the bottom while the gas turns upward into the vortex and leaves through the top of the unit. Pressure drops through cyclones are usually from 13 to 17 mm water gauge. Although seldom adequate by themselves, cyclone separators are often an effective first step in pollution control. Separating solids or liquids from a gas is one use of scrubbers. However, separating a soluble gas from other gases is the application where scrubbers see the most action. 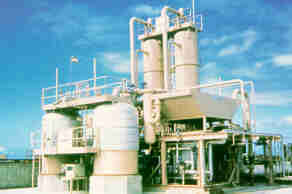 Typically, a gas enters the bottom of a scrubber and moves upward while a liquid is sprayed from the top. The soluble gas is carried away by the liquid exiting out the bottom of the unit. The most common application is flue gas desulfurization using ammonia as the solvent or spray liquid. Pressure drops through scrubbers are usually low if they're sized properly, and scrubbers are generally about 50% efficient so multiple units are sometimes required or packing may be used to increase efficiency. The contaminated liquid exiting the scrubber represents it's own disposal problem. The advantage of semidry scrubbers is in that they remove contaminates by way of a solid waste that is easier to dispose of (less expensive). Initially, the scrubbing medium is wet (such as a lime or soda ash slurry) then a spray dryer is used to atomize the slurry into the gas which evaporates the water in the droplets. As this takes place, the acid in the gas neutralizes the alkali material and forms a fine white solid. Most of the white solids are removed at the bottom of the scrubber while some are carried into the gas stream and have to be removed by a filter or electrostatic precipitator (discussed later). Although semidry systems cost 5-15% more than wet systems, when combined with a fabric filter, they can achieve 90-95% efficiencies. Dry scrubbers are sometimes used in a very similar fashion, but without the help of gas-liquid-solid mass transfer, these systems use much higher amounts of the solid alkali materials. 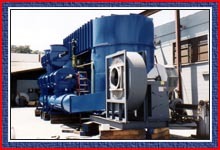 Boasting an efficiency in excess of 99%, electrostatic precipitators are very effective at removing tiny particles from gas streams. Gas flows through a rectangular duct containing rows of metallic strips. The strips are negatively charged by way of a small voltage that is applied (about 200 W for every 1000 ft3/min of gas). The efficiency is a result of the precipitators applying the collecting force to the particles only and not the gas. Periodically, the precipitators have to be taken offline and cleaned. Three types of treatment are generally used for streams with high concentrations of VOC: Refrigerated Vapor Condensation, Solvent Vapor Adsorption, and Flaring. The method chosen is dependent on allowable release concentrations and the value of the solvent. Refrigerated vapor condensation can mean condensation at temperatures as low as -80 0C. Due to the high cost of refrigeration, this option is usually reserved for expensive solvents whose recovery can justify the high operating costs. Solvent vapor adsorption is a more common application where the VOC containing gas is bubbled through an organic solvent which "accepts" the VOC in the gas stream. The VOC are then released from the solvent by heat and a partial vacuum. They can then be condensed at a much higher temperature than the refrigerated method in the absence of large amounts of inerts. An example of this may be the popular removal of propane by using MTBE as a solvent. Flares can be used to handle flow and concentrations surges along with other recovery methods for high concentrations of VOC. The combustion (and thereby loss) of VOC's, produce NOx emissions and is typically unacceptable as the only means of eliminating VOC from highly concentrated streams. For moderate concentrations of VOC, incineration or regenerative carbon adsorption is utilized. At temperatures between 750-1000 0C, VOC are typically destroyed at a rate of 99%. Usually, a heat exchanger is used to preheat the gas stream with the flue gas to save on fuel costs for the incinerator (pictured left). Worth a mention is that the presence of chlorides may require a more exotic material for the incinerator and heat exchanger. Catalytic incinerators can save on fuel costs by destroying VOC on a catalyst's surface at 430 0C. With similar capital costs, the extra expense is usually in the catalysts. Also, streams containing chlorides can produce HCl when burned and the acid can attack some catalysts. Other compability issues also have to be addressed before using catalytic incineration. Regenerative carbon adsorption is where a gas stream passes through a bed of activated carbon. The VOC are adsorbed into the carbon. Regeneration consists of stripping with low pressure steam followed by air drying. Water and VOC are recovered by condensation. This method can achieve 99% effectiveness for VOC concentrations from 10 to several hundred parts per million. Economics usually favor this process when the VOC are insoluble in water and are liquids at room temperatures. Carbon adsorption is not a good choice for gaseous organics (at room temperature), air streams above 38 0C or 50% relative humidity. Under these conditions, the VOC do not bind well to the carbon. Using carbon adsorption for ketones is also not recommended due to their tendency to polymerize on the carbon's surface thereby deactivating the carbon. Low air flows containing low concentrations of VOC are typically passed through "disposable" canisters of activated carbon. These canisters are purchased from the supplier then the spent canisters are traded for fresh canisters (ie. 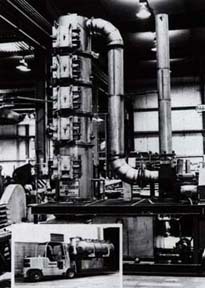 the suppliers typically handle the regeneration process). Activated carbon will typically have a loading capacity of 0.3 lbs of VOC per pound of carbon at 100 ppm and 0.15 lbs of VOC per pound of carbon at 5 ppm. Typical carbon costs are $2.30-$2.60 per pound. At higher flowrates, carbon adsorption-incineration combinations may be needed. SONNVL có mấy mỗ hình dùng để xử lý khí thải hay quá. Trong qua trình tính toán, nếu nồng độ các khí thải dưới nồng độ cho phép quy định tại TCVN thì không cần xử lý. Mà rác thải thì biến đổi liên tục, do vậy cần quan trắc nồng độ khí thải trong khói thải theo thời gian nhất định: 3 tháng, 6 tháng, 12 tháng để đưa ra cách xử lý thích hợp. Khi quan trắc khí thải thì phải quan trắc theo hướng gió, có khí phải lấy trực tiếp từ ống khói, leo lên ống khói khi nó đang xả khỏi à (nghe cứ như hình phạt BÀO LẠC ngày xưa do ĐẮC KỶ nghĩ ra ấy nhỉ), không, phải có cách chứ. Nitrogen oxides are products of all conventional combustion processes. They are also a target of many environmental regulations, with good reason. In short, SCE is a process to reduce NOx to nitrogen and water with ammonia in the presence of a catalyst between 540-840 0F (282-449 0C). Ammonia is usually injected at a 1:1 molar ratio with the NOx contaminants. Ammonia is used due to its tendency to react only with the contaminants and not with the oxygen in the gas stream. Ammonia is injected by means of compressed gas or steam carriers. Efficiencies near 90% have been reported with SCR. Ammonia is injected in a 2:1 molar ratio in this process.